Previously, we have talked about how to install SSL certificate on Nginx Server, how to install Let’s Encrypt free SSL/TLS certificate in your server. We recommend to read both of them, at least check them. Many Users Complain of Not Working OCSP Stapling in Nginx or Facing Chain Error. Here is Working Step by Step Guide on OCSP Stapling Nginx. We recommend to switch to free Let’s Encrypt or use Free Start SSL unless there is any need to use DV SSL/TLS Certificate. Let’s Encrypt is open and Free Software, chance of exploit, bug is far lesser. It is matured now to use for professional blogs. OCSP Stapling Nginx : Why We Need OCSP Stapling, What it Does, Who Needs it? OCSP stapling is a simple method for quickly and safely determining whether the SSL certificate is valid. It allows the web server to provide information of the validity of its own certificates to the browser rather than allowing request the information over network to the certificate’s vendor. There is no real performance slowdown to own server for implementing OCSP Stapling. OCSP Stapling is purely a performance enhancement in theory. However, in practice, it does indeed improve security. OCSP Stapling gets around both the performance impact and the privacy issue by letting the original web server periodically query the OCSP Responder itself, and then serve clients both its own certificate as well as the proof from the OCSP Responder that the certificate isn’t revoked. Because this removes the performance hit for the client and the privacy issue, browsers are more likely to implement support for OCSP Stapling rather than just OCSP, thus it indirectly helps in security. So the advantages include faster load times for secure content at least theoretically and higher customer satisfaction for multiple domain request becomes obvious – like for online payment. RFC 6961 defines a Multiple Certificate Status Request extension. 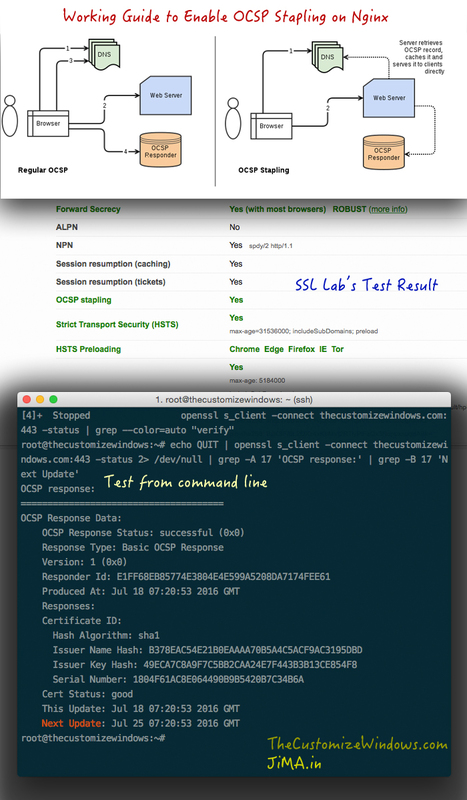 Multiple Certificate Status Request extension allows a server to send multiple OCSP responses in the TLS handshake. The currently used version of the proposal is extended to support additional TLS extensions following the repair of the Heart bleed OpenSSL bug. Most browsers do not implement any kind of public CRL because CRL doesn’t scale – OCSP was proposed to replace it. OCSP Stapling should be used by all unless there is any reason not to use. Who have followed steps like we described for SSL/TLS certificate installation on how to install SSL certificate on Nginx Server, should not face much difficulty in understanding steps. We assume that the user have separate X.509 version of SSL/TLS certificates like GeoTrust typically sells when purchased from them, which are just like plain text, can be copy pasted, starts with keywords like -----BEGIN CERTIFICATE-----. Within a sane range actually any extension can be used – .pem, .cer, .cert or just filename without any extension. Do not get scared with .pem extension. Basically these certification authorities were fully closed source before Let’s Encrypt appeared. Their employees used to write the few lines guide in the way they wanted. Unless you are getting error on frontend or SSL Labs test, take them as X.509 version of SSL/TLS certificates. Servers are *nix, they will read rightly regardless of filename extension. If your CA provides certificates in DER format you need to convert them to PEM/X.509 version (there are online tools, SSH command etc.). GeoTrust QuickSSL Premium will normally supply X.509 version of domain’s certificate and intermediate certificate. The root certificate will be available on the certificate provider’s website. As there can be many types of root certificates of a typical certificate provider for various types of certificates, before downloading the text file root certificate, running a test on SSL Labs online tool will show the Issuer name, like GeoTrust Primary Certification Authority G3 for GeoTrust DV SSL certificates as example. GeoTrust has a list of various root certificates, the user need to select the right one. In the same way, certificates from other CA’s should properly match. This Article Has Been Shared 7302 Times! LTE stands for Long Term Evolution and is also known as the fourth generation, which is why the abbreviation is often used 4G mobile technologies. Cite this article as: Abhishek Ghosh, "OCSP Stapling Nginx : Working Guide to Enable," in The Customize Windows, July 18, 2016, April 21, 2019, https://thecustomizewindows.com/2016/07/ocsp-stapling-nginx/.